Made this for a dungeons and dragons game I went to last night. We were so engaged with the game and getting our characters put together that we didn’t have much time to taste it. That and one of the folks at the game is on Atkins, once I found out it seemed rather cruel to engage in carb deliciousness in front of someone trying to avoid them. We did when we finally got home though! Num! What is it about helping to kill a couple of skeleton creatures and a corpse lobster monster that can make a girl so hungry? You know, there’s some good eatin’ in those lobster monsters ya know. Cast burning hands! Preheat oven to 350F. 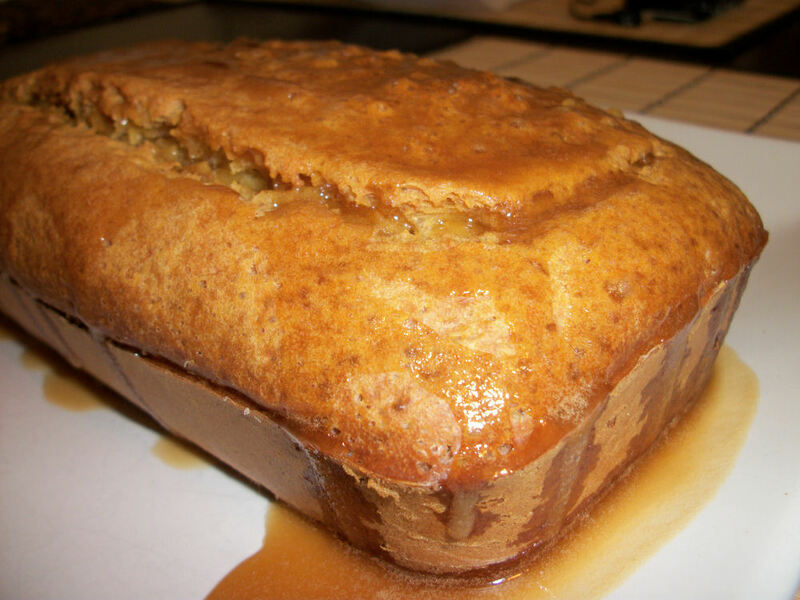 Spray 4×8 loaf pan. Combine flours, baking soda, baking powder and salt in large bowl. With mixer on medium, beat the margarine, sugar, eggs, rind, and vanilla in another bowl until blended. With mixer on low add mix to flour, alternating with milk until combined. Pour batter into pan and bake about 55 minutes. Combine lemon juice and powdered sugar until smooth to make the glaze. Remove loaf from pan. Spread glaze over hot loaf and let cool 20 minutes. Makes 12 servings. Each serving contains 112 calories, 2 grams of fat and .8 grams of fibre if you make it with the splenda option. Oops gotta go, just noticed that run fatboy run is on. I love that movie. It has been not only amusing but inspiring. Definitely a good workout movie….and I adore Simon Pegg. This entry was posted in Dessert, Snack and tagged Bread, Lemon. Bookmark the permalink.